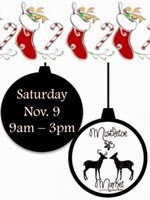 "Come join us for our 4th Annual Mistletoe Market at Crosspoint Church in McKinney, sponsored by Crosspoint MOPS. More than a craft show with over 50 vendors, plus specialty food trucks, bounce house, children's used book sale, bake sale, and so much more!" "The Byron Nelson High School Bobcat Dazzler Dance Team is hosting their 5th Annual Craft Fair on Saturday, November 9, 2013 in Trophy Club. Join us as we "Kick-off" the Holiday Season with our Holiday Bazaar! This year's bazaar is the perfect place to find unique Gifts, Crafts, Apparel, Home Decor, Bling, Cosmetics, and Food! Free Admission! Live Entertainment and Door Prizes!" "For a unique holiday shopping experience, Holiday House presents a variety of one of a kind gifts & artisans featuring handmade jewelry, clothing, home & holiday decor, food and children's gifts. Show date is Sunday, Nov. 10th from 10:00 am to 4:30 pm at Coppell High School, 185 W. Parkway Blvd. Admission is $5 for adults, $2 for students & kids under 10 are free. Concessions are available. All proceeds benefit CHS Project Graduation, a nonprofit organization that provides a smoke, drug & alcohol free Graduation Night celebration for all seniors at Coppell High School. " "The Funky Finds Holiday Shopping Experience is a FREE 2-day family AND pet-friendly handmade shopping event showcasing over 120 artists, crafters & designers selling unique items they have hand-crafted. Event also features swag bags, charitable raffle, on-site animal adoptions, Toys for Tots drive AND MORE!" "Our 10th year highlighting woodwork, metal art, handcrafted jewelry, children's items, pottery, wreaths, paintings, food and many other great booths! Barbara's Tearoom is again serving delicious food throughout the fair!" "Monthly Two Day Trade Days Event (Saturday and Sunday prior to the Second Monday of each month). Offering handmade arts, crafts, new retail items, candles, jewelry, clothing, food concession, antiques and uniques and much more. Free parking and Free admission!" "Multiple vendors specializing in hand crafted items, door prizes, activities for the kids, food and beverages available." "Join us for our 18th annual bazaar! Show includes 40+ vendors with original crafts such as woodworking, decorative wreaths, jewelry, greeting cards, mosaic art, metal sculpture, knitted and crocheted accessories, quilted items and much more. " Located west of Montgomery Street and east of Hulen Street on Camp Bowie. "Event to help support the FFA students of Allen High School with travel expenses and student projects. The event will be in conjunction with our Pancake Breakfast on Saturday, November 9th at Allen High School Cafeteria in Allen, TX." Admission is $3 for adults, students and children free. "4th Annual CDA Craft Fair - Crafters and vendors will display and sell their goods. Benefiting Catholic Daughters if the Americas (CDA) local charities and scholarship fund." "This year’s AMAMOM Craft Fair will be held on November 9, 2013! We are looking forward to another successful year as shoppers get a head start on holiday shopping. We will feature such popular items as custom jewelry, holiday decor, boutique clothing, candles and homemade crafts. We will also be having goodie bags, giveaways and bake goods! All proceeds from this event will go to the Allen McKinney Area Mother's of Multiples, a non-profit support group whose activities are directed toward the unique needs of mothers of twins, triplets, and higher order multiples." "Sell! Sell! Sell! Promote your products at Celina’s Bobcat Bazaar & Marketplace. Area school fans will be looking for products to show their team spirit in Bobcat orange & white, Gunter blue, Prosper green & Pilot Point orange & black. A concession stand will serve food & drinks. Door prizes, Raffle Drawings. Kids activities planned. Admission is free! Proceeds benefit the outstanding band programs at Celina Middle & High Schools." "7th annual Guyer choir Craft Show features over 100 vendors of arts, crafts, clothes, jewelry, quilts and more. Admission and parking are free."" "Join us for a Holiday Bazaar at Collin Creek Community Church. Save the date for a day shopping, fellowship and fun while shopping and crafting all to help support the ministry of Dayspring Assisted Living Home. Two gyms with local vendors and crafters! Raffles! Pinterest Party sponsored by Recollections Photography!" "Holiday Market & Expo - This will be the place to get all your holiday shopping done. Need a gift for a co-worker, family member, sister, daughter. You will not want to miss this one. Raffles, fun and best of all YOU." "Mimosa Lane Baptist Church Mesquite Annual Craft Fair - This will be a great opportunity to shop early for Christmas, find that unique gift for someone special, or just enjoy shopping for you. The men of the church will have Mimosa Café open for lunch. Plus a delicious bake sale. Our vendors will be selling jewelry, candles, crochet items, greeting cards, home décor, homemade items, books, perfume, specialty gifts, and much more! All proceeds from this craft fair help to support our missions locally and around the world." "This is our 5th year of the events and we have a wide variety of vendors for your shopping needs. This is a great place to come for your Holiday gift needs. All Proceeds will benefit Project Graduation."